Click to open Web Gallery of Art commentary page. Click image again for extra large view. This imagery, serpent & pole, seems widespread in a variety of cultures. Click for myriad images relating to the brazen serpent. Click for wikipedia article on The Nehushtan. Click for wikipedia article on the Rod of Asclepius. Click for wikipedia article on the Caduceus. 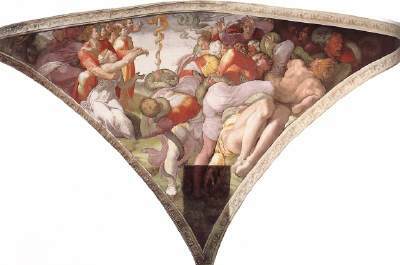 Please read a companion essay to this post: The mural and the fresco at http://bit.ly/wDDZay in which Hovak Najarian sets out the difference between mural and fresco and shares the process by which a fresco is made.